International best-selling author William Stanek helps you get the edge you need. Whether we like it or not, writing is a part of our every day lives and to get by you need an edge. 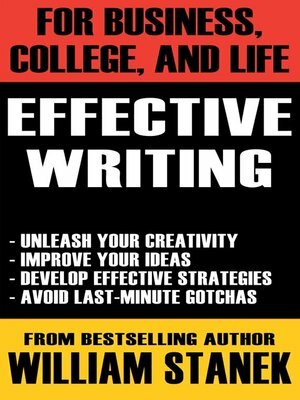 Enter Effective Writing for Business, College & Life: the down in the trenches writing resource you need to be successful. Use this concise guide to help you: write essays, papers, and dissertations; create reports and presentations; develop articles, stories, and novels; publish online, and CD-ROM. Business, college and life always give us writing challenges and it is time you took control. This indispensable resource will help you be creative, get organized, be effective, and complete the task at hand.